A 23-year-old man, Christopher Arigidi, last Wednesday, allegedly R@ped a 3-year-old in Apata, Ese-Odo LGA of Ondo State and youth of the area are accusing the community chairman, Rufus Jagun, of trying to cover it up. According to reports, Arigidi, who attended a naming ceremony in the community, took the victim to his house and allegedly defiled her, by rubbing engine oil on her private parts to ease penetration. In a chat with Punchng, one of the youth, Oshodi Ibeji, said: “The suspect and some people were sitting together at the function; all of a sudden, the guy stood up and said he wanted to go and change his cloth at home. .
As he was going, he took the girl along with him; the mother of the victim saw him when he was going. When the mother went back home, she did not see her daughter so she went to Argigidi’s house and found out that the girl had been defiled. .
After discovering what happened, she reported to the youths who went to the man’s house to beat him up. He was later taken to the community chairman. He initially denied it but later confessed that he did it.” . Ibeji, however, said the youths were not happy with the way the community chairman was handling the case. He noted that Arigidi’s family came to beg the chairman and he had released the suspect to them. . The victim’s mother, Pouma Ologun, said she wanted justice for her daughter, adding that she wanted the community to deal with Arigidi. . However, the community chairman, Jagun, denied releasing Christopher to his family. He said, “I told some people to lock him up in a room since we don’t have a police station in our community. .
0 Response to "Shame! 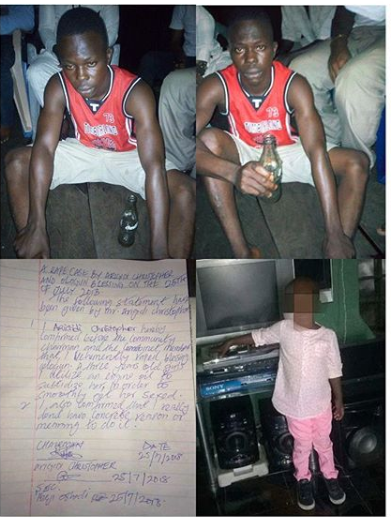 How Man Used Engine Oil To Defile 3-Year-Old Girl (Photos)"